View More In Serving Knives. Yamazaki's Cache Gold Accent is a rich pattern like no other. 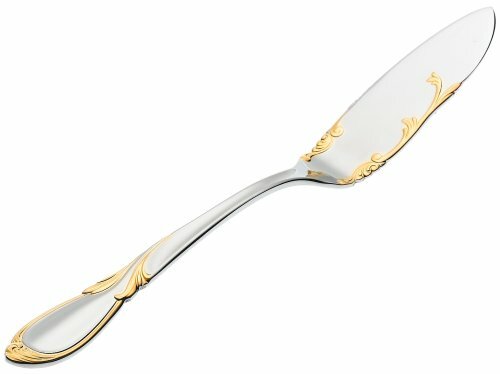 The romantic asymmetrical flourishes of Cache Gold Accent are reinforced with a distinct design signature of unique piercing embellishing the tines of each fork creating a look that is both ornate and breathtaking. If you have any questions about this product by Yamazaki, contact us by completing and submitting the form below. If you are looking for a specif part number, please include it with your message. Sant Andrea Elevation 18/10 Stainless Steel Butter Knife -- 12 per case. World Tableware Stainless Steel Resplendence Butter Spreader, 6 1/2 inch -- 36 per case.